Robert Cray was born on August 1, 1953. By the age of twenty, he had seen Albert Collins, Freddie King and Muddy Waters live, and decided to form his own band. 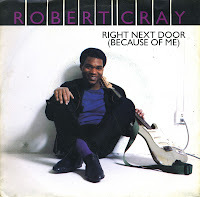 After years of regional success, Robert Cray was signed to a record company in 1982. He released his breakthrough album 'Strong persuader' in 1986. The single 'Right next door' was released in the summer of 1987, and it was his first international success, peaking at number 50 in the UK singles chart and number 2 in the Dutch Top 40.